Astrophysical evidence suggests that the Universe contains a large amount of non-luminous dark matter, but no definite signal has been observed despite concerted efforts by many experimental groups. 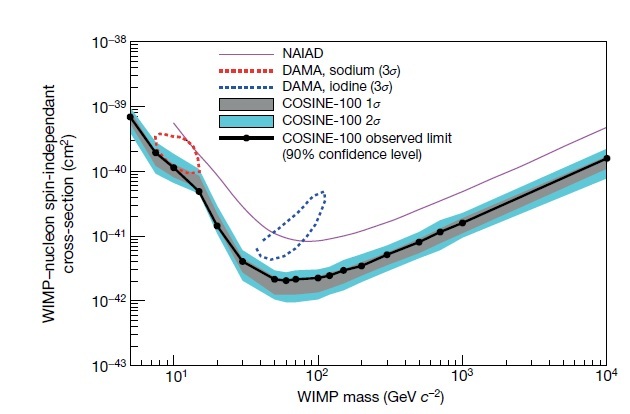 One exception is the long-debated claim by the DAMA group of an annual modulation in the events observed in their detector using sodium-iodide target material as might be expected from weakly interacting massive particle (WIMP) dark matter interactions. The new COSINE-100 experiment, an underground dark matter detector at the Yangyang Underground Laboratory (Y2L) in Korea is starting to explore this claim using the same medium and now has first results that significantly challenge the interpretations made by DAMA that have stood for nearly two decades. Y2L is operated by the Center for Underground Physics (CUP, Director: Yeongduk Kim) of the Institute for Basic Science (IBS) in Korea. A critical point is that COSINE-100 is investigating the claimed dark matter detection of DAMA using the same target material as DAMA and is the first to release significant results by this means. In a paper published in the 7734 issue of the journal Nature, the collaboration describes results from the first phase of work, a search for the dark matter signal by looking for an excess of events over the expected background. This study indicates that there are no such events present in the data, confirming that DAMA's annual modulation signal is in severe tension with results from other experiments under the assumption of the most traditional so-called Standard Halo Model for dark matter in our galaxy as shown in Fig. 1. ▲ Fig. 1 Exclusion limits on the WIMP-nucleon interaction. The observed (filled circles with black solid line) 90% exclusion limits on the WIMP-nucleon interaction are shown with bands for the expected limit assuming the background-only hypothesis. The limits exclude a WIMP interpretation of DAMA/LIBRA-phase 1 of 3 σ allowed region (dot-contours). The limits from NAIAD, the only other sodium iodide based experiment to set a competitive limit, are shown in magenta. "The result of this search is significant because, for the first time, we have sizeable sodium-iodide crystal detectors with enough sensitivity to look at the DAMA signal region. It has been for 20 years that the potentially significant claim has not been reproduced using the same crystals independently,"" said COSINE-100 co-spokesperson and the associate director at CUP, Hyun Su Lee. "The initial results even carve out a fair portion of the possible dark matter search region drawn by the DAMA signal. In other words, there is little room left for this claim to be from the dark matter interaction unless the dark matter model is significantly modified." The COSINE-100 collaboration is composed of 50 scientists from Korea, the United States (with co-spokesperson Professor Reina Maruyama in Yale University), the United Kingdom, Brazil, and Indonesia. COSINE-100 began data taking in 2016. The experiment utilizes eight low-background thallium-doped sodium iodide crystals arranged in a 4 by 2 array, giving a total target mass of 106 kg. Each crystal is coupled to two photosensors to measure the amount of energy deposited in the crystal. The sodium iodide crystal assemblies are immersed in 2,200 L of light-emitting liquid, which allows for the identification and subsequent reduction of radioactive backgrounds observed by the crystals. 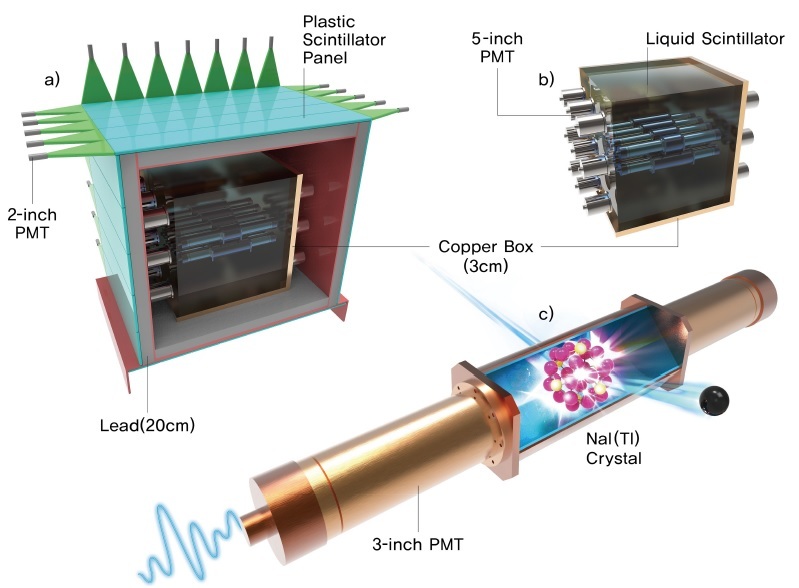 The liquid scintillator is surrounded by copper, lead, and plastic scintillator to reduce the background contribution from external radiation, as well as cosmic-ray muons. The detector schematic is shown in Fig. 2. ▲ Fig. 2. The COSINE-100 detector. The detector is contained within a nested arrangement of shielding components shown in schematic a). The main purpose of the shield is to provide full coverage against external radiation from various background sources. The shielding components include plastic scintillator panels (blue), a lead brick enclosure (grey) and a copper box (reddish brown). The eight encapsulated sodium iodide crystal assemblies (schematic c)) are located inside the copper box and are immersed in scintillating liquid, as shown in schematic b). "So far, we have not yet discovered the dark matter particles in this search but we have come closer to testing the origin of the DAMA signal on whether this is from dark matter interactions or some unknown systematic effect,"" said Chang Hyon Ha, research fellow at CUP. Despite the strong evidence for its existence, the identity of dark matter remains a mystery. Several years of data will be necessary to fully confirm or refute DAMA's annual modulation results. Improved theoretical understanding and more data from the upgraded COSINE detector (COSINE-200) will help understand the mystery of the signal. To help achieve this goal, CUP is currently constructing a new experimental site in a deeper and more spacious location, called Yemi Laboratory in Jeongseon County. COSINE-100 is currently collecting data with continuous improvement in understanding the detector. Yeongduk Kim, Hyun Su Lee, Reina Maruyama, and Neil Spooner conceived the COSINE-100 experiment. Department of Physics, Sejong University, Seoul, South Korea. Department of Physics, Yale University, New Haven, CT, USA. Physics Institute, University of São Paulo, São Paulo, Brazil. Department of Physics and Astronomy, Seoul National University, Seoul, South Korea. Department of Physics, Bandung Institute of Technology, Bandung, Indonesia. Department of Physics and Astronomy, University of Sheffield, Sheffield, UK. Center for Underground Physics, Institute for Basic Science (IBS), Daejeon, South Korea. Department of Science Education, Ewha Womans University, Seoul, South Korea. Department of Physics, Sungkyunkwan University, Suwon, South Korea. Department of Physics and Wisconsin IceCube Particle Astrophysics Center, University of Wisconsin-Madison, Madison, WI, USA. Department of Physics, Kyungpook National University, Daegu, South Korea. Korea Research Institute of Standards and Science, Daejeon, South Korea. IBS School, University of Science and Technology (UST), Daejeon, South Korea. Department of Accelerator Science, Korea University, Sejong, South Korea. Department of Physics, University of Illinois at Urbana-Champaign, Urbana, IL, USA. IBS was founded in 2011 by the government of the Republic of Korea with the sole purpose of driving forward the development of basic science in South Korea. IBS has launched 28 research centers as of December 2018. There are nine physics, one mathematics, six chemistry, eight life science, one earth science, and three interdisciplinary research centers.